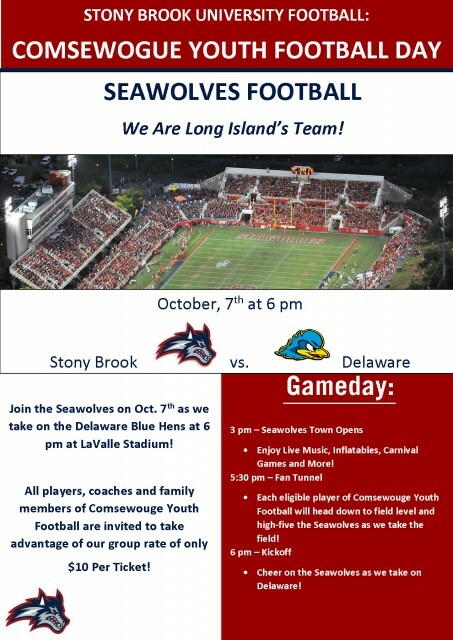 STONY BROOK UNIVERSITY FOOTBALL PRESENTS "COMSEWOGUE YOUTH FOOTBALL DAY"
JOIN THE SEAWOLVES ON OCT. 7TH AS THEY TAKE ON THE DELAWARE BLUE HENS AT 6 PM AT LAVALLE STADIUM! ALL PLAYERS, COACHES AND FAMILY MEMBERS OF COMSEWOUGE YOUTH FOOTBALL ARE INVITED TO TAKE ADVANTAGE OF OUR GROUP RATE OF ONLY $10 PER TICKET! COME SEE THE COMSEWOGUE 11'S PLAY DURING HALFTIME!! BE SURE TO ADD THE TAILGATE PARTY TO YOUR PURCHASE!! If you are attending this event, please download, print, and complete the attached waiver, and return it to your Team Mom.